Although the SentryOne client receives the majority of its information from the SentryOne database, there's times when the client must connect directly to a monitored server to receive information. When Does the SentryOne Client Connect Directly to a Monitored Server? A real-time action is initiated. A job manually starts or stops. The SentryOne client also connects directly with the monitored target when a forced metadata and history sync is performed. Select CTRL + Refresh on the toolbar to perform this action. This is different than just selecting Refresh, which only retrieves information from the SentryOne database. In cases where the client needs to connect directly to a monitored instance, the authentication method used varies depending on the specified User Connection Properties of that instance. Note: By default, the client uses the credentials of the interactive user whenever it needs to connect directly to an instance. Access the User Connection Properties for an instance by right-clicking the desired instance to open the context menu, and then select User Connection Properties. Unselect the Use Integrated Authentication check-box, enter your desired account information, and then select Ok to save your information. There are a few differences regarding how authentication works depending on whether you're accessing the instance from the context of the Shared Groups node or the context of the SQL Server Registrations node in the Navigator pane. For SQL Server instances accessed within the context of the Shared Groups node, Windows Authentication is used by default. However, if you've specified SQL Server credentials using the User Connection Properties context item, those credentials are used instead. For SQL Server instances accessed within the context of the SQL Server Registrations node, the client uses the authentication method and credentials defined for the corresponding SSMS registration. This is also referred to as the native registration and is accessed using the instance's Edit Registration Properties context menu item. 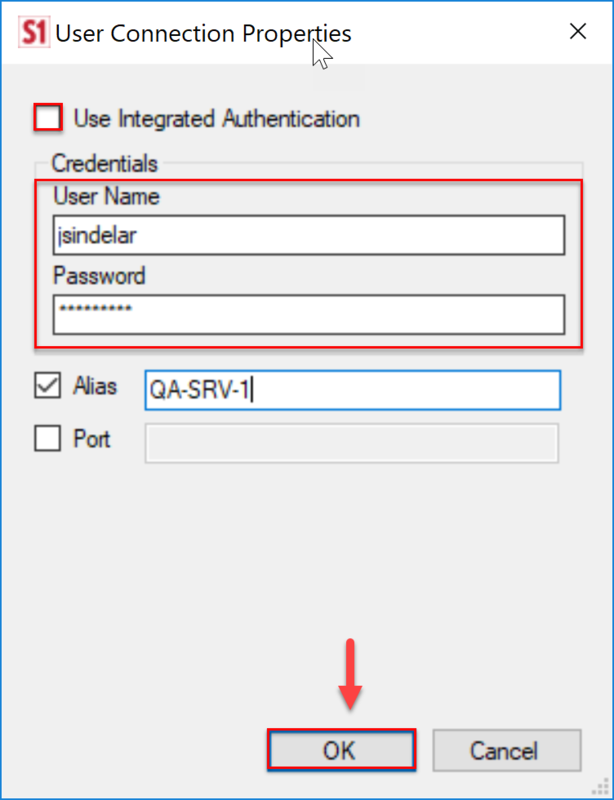 If SQL Server authentication credentials are set using the User Connection Properties context item, those credentials are used instead, and they effectively override the authentication settings of the native registration. The initial connection to the target is always made using the native registration credentials to allow the client to determine the identity of the SQL Server, and ensure it isn't already being Watched using a different name. For information about restricting user access within the SentryOne client based on Windows and SQL Server Authentication accounts, see the Rights Based Security topic. For information about restricting user access within the SentryOne client based on SentryOne database roles, see the Role Based Security topic.